Learn everything you need to know about the KonMari Method. This complete guide will walk you through every step. 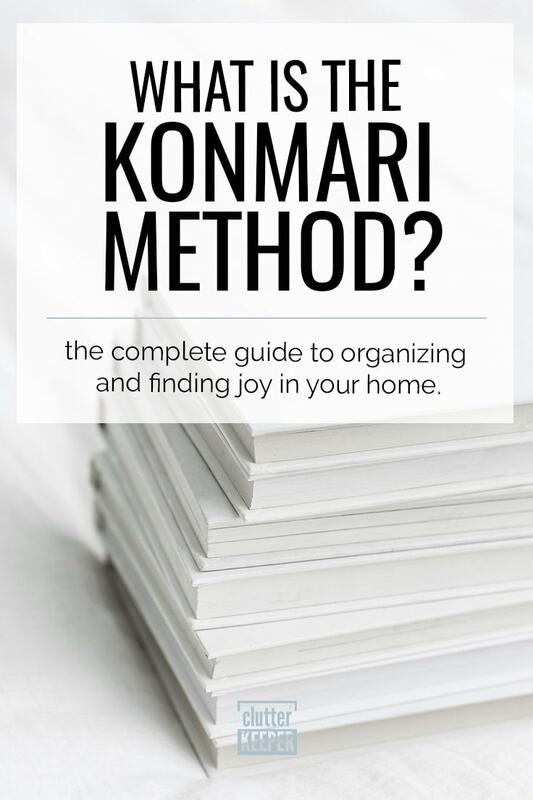 Have you heard the buzz about the KonMari method? Maybe you’ve seen the social media posts or you watched the show Tidying Up with Marie Kondo on Netflix. 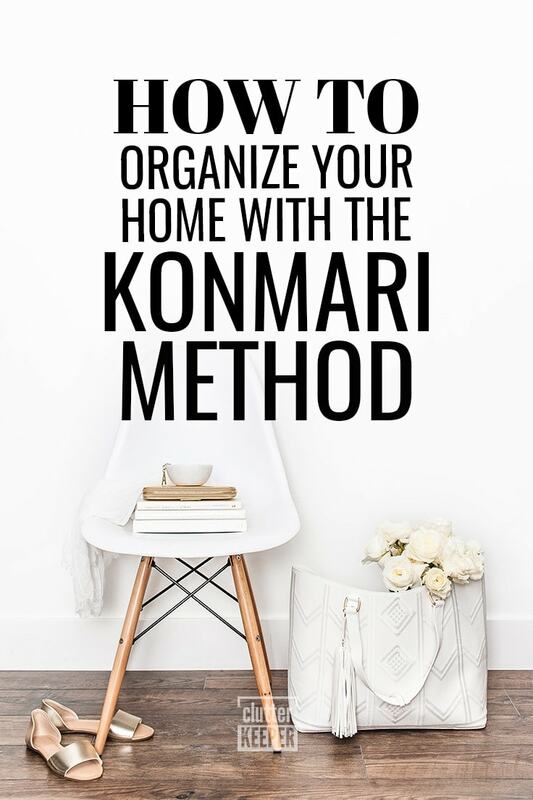 The KonMari method is a way of organizing and maintaining a clean home that was started by Marie Kondo. Who is Marie Kondo? Marie Kondo grew up in Japan. According to her website, she began an organizing business at the age of 19. Her business grew very quickly. She first wrote the book The Life-Changing Magic of Tidying Up in 2011 entirely in Japanese. The German translation was released in 2013 and the English translation was published in 2014. By the time her book was released in English, she was a Japanese celebrity. In her book and television show, Marie Kondo’s KonMari method takes you on a journey of tidying up. This guide will explain and describe the massively popular method. If you want to learn even more, buy the New York Time’s Best-Selling book The Life-Changing Magic of Tidying Up. In Marie Kondo’s method, there is a respect for things, elevating possessions to where they deserve respect and gratitude. As you read her book, you will be transported to a mindset that has spiritual elements to it. The first place to start with KonMari is to prepare to remove things from your home that don’t hold any value. This method is minimalism at its best. You’ll go through the five categories of your possessions and try to donate or throw away a portion of them. As you give away your old clothes or books, thank them for the role they played in your life. This mindset will be explained shortly. What sets this method apart from other types of minimalist organization methods is Marie Kondo’s focus on sparks of joy. In her book and on her Netflix show, she urges people to pick up an object. Does it “spark joy”? If not, give it away. What does “spark joy” mean? It’s an emotional reaction, much like you might feel when you pet a puppy or hear a baby giggle. Some people are more sensitive to the spark of joy than others. If you don’t feel anything when you touch a shirt or book – even things that hold tremendous sentimental value – it’s ok. The most important thing is to only keep the items that you cherish and/or use regularly. In the KonMari method, Marie will spend time “greeting” a home. She tells people to thank their possessions as they put them away and give them away. This might be because when you respect your possessions, you are more likely to put them where they belong and keep them tidied up. Another striking part of the KonMari method is how she organizes things by category, not by room. Instead of going room by room, she organizes types of possessions, all at once. These are the KonMari categories, and their explanations. Clothes – Put all the clothes from each member of the family on their own bed. Yes, all the clothes. It might look like a giant mountain of fabric. Then, go through and touch every single piece of clothing. Does it spark joy? Keep it. If not, thank the clothing and give it away. Books – Not surprisingly, this is the most divisive part of the entire method. So many people have emotional connections to their book collections. It’s important to only keep the books that mean something to you, and not just collect them erroneously. Papers – Today is the digital age. All paper can be scanned and saved to the computer. Go paperless if you can. Komono (Miscellaneous stuff) – This category is very broad. It includes everything else – the kitchen, living room, bathroom stuff, literally everything that isn’t a book, paper, clothes or sentimental things. Sentimental – Save this one for last. After you minimize every other category, begin to display your sentimental items. This is all part of making your home bring you joy. Family photos and other memories spark joy in a very unique way. Finally, as you put things away, you want to sort everything you are keeping in such a way that it brings you joy to look at it. Have you felt a certain joyful satisfaction when looking at organization images on Pinterest? That’s the feeling you want to aim for in your own home as well. Here are a few organizing ideas that could bring you joy. Arrange clothes in a drawer in a color-gradient – Start with dark clothes and end with the lightest colored ones. Hang clothes in a closet from longest hem to shortest – organize clothes by the length of the hem. Use boxes everywhere – Sort your drawers and all your shelves using small boxes. You can even use smaller boxes inside larger boxes for even more beautiful organization. Organize books by size and color – A rainbow of books can best be shown off if you sort them by color. Fold clothes so they are standing up – This is known as the KonMari folding method. There is more about that later on in this guide. How Long Does KonMari Method Take? Depending on how much help you have, it could take quite a bit of time. According to Vox, it could take up to 6 months to completely organize your entire home. The most important thing is to pace yourself. Tackle each category one at a time before moving onto the next one. Split up the Komono (miscellaneous) category into small chunks if you need to. Folding socks, shirts and pants will never be the same again. When you fold using the KonMari method, you actually free up more space in your drawers. Plus, this method makes it so you can see every single item in one glance. That will shave minutes off your morning routine, and prevent you from messing up your piles of folded clothes when you get something out of it. How do you fold clothes like Marie Kondo? This video shows you every step. Now that you know almost everything about KonMari organizing, how about some real life inspiration? These photos from Instagram will inspire you to go through your home, donate unloved items, and sort everything else. They are incredibly beautiful! We transformed this tiny house closet in just a couple hours thanks to a winning combo of file folding and soft storage bins from @idlivesimply ✨ I know you all are Marie Kondo Tidying experts by now thanks to Netflix, but vertical file folding allows you to see your entire wardrobe at a glance 🤩 And can you believe three very well dressed people share this closet space? Talk about #capsulewardrobe goals! This closet is so dreamy. Every single box has a specific use and role. It shows that you don’t need a giant walk-in closet to store all your clothes. You can use boxes and shelves. Another thing that’s so attractive about this space is how they used matching boxes. You can always save money by using a variety of different shapes of containers, but the symmetry here is breathtaking. Another place to organize and sort into boxes is the desk drawer. The beauty of this space is how you can see every single thing in the drawer without moving things around. The above photo is definitely pantry goals! Notice the matching baskets, the glass jars, and the sheer lack of extra junk taking up space. The minimalism here is so serene. There is something just perfect-looking about matching boxes and containers. This office drawer shows that you can still have a collection of pens and keep it organized. Keep the books that bring you joy and display them with pride. Ahhhh, rainbow books! The colorful books are accentuated with the bright pink bookshelf. If you are organizing your rooms, you might as well treat yourself to some redecorating too. So, are you ready to minimize and find joy in your home? Here are some tips for being successful with this method. Above all, the best way to find success with the KonMari organizing method is to buy the book. This guide is super helpful, but nothing is as reliable as first-hand accounts. As you read the book, leave notes for yourself and start creating an action plan. Now that you know what you need to accomplish set aside some time to sort through all your stuff. The photo below is a lovely way to establish a priority list for everything you own. The best part about the checklist below is how the Komono category is split up into subcategories. 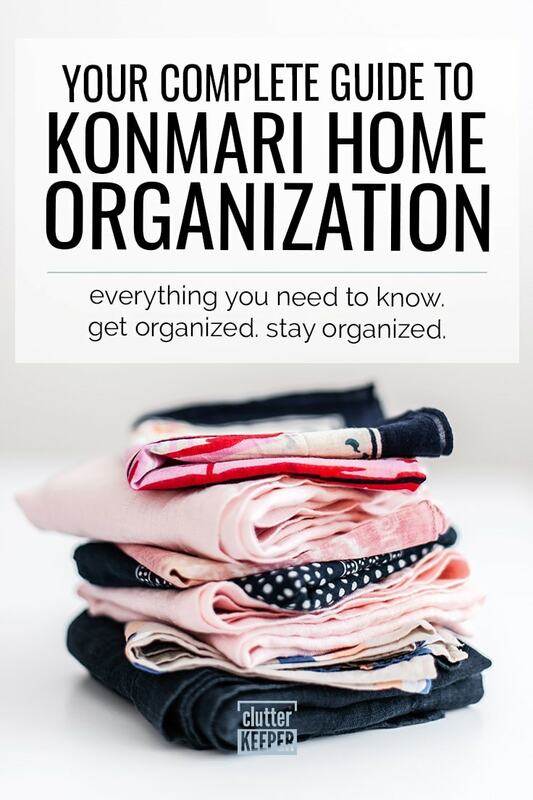 KonMari checklist and schedule from @journal.jungle! I love the customization of sub-categories and the precise scheduling 💕 What tools did you use to map out your tidying journey? Photo by @journal.jungle. You will be even more successful if you become sensitive to the feeling of “joy” when it comes to possessions. That is one of the pillars of this entire method. Practice it a few times. If you are a more practical person and trying to attach feelings to things is foreign to you, try to think of everything you sort as useful or not. After you find a place for everything you own that brings you joy, maintain your tidy space. If you receive gifts, create a space for them to live. This might mean removing other things from the home. Make it a habit to go through your things and donate some of them if you start running out of room or find yourself stuffing things haphazardly in drawers. Another key component of the KonMari method is the sorting of items into boxes. So before you begin sorting, make sure you have plenty of boxes on hand. You can use boxes, baskets, or other containers. And since this organizing process involves seeking joy, invest in matching containers. You will experience a great deal more joy when you see matching baskets and boxes all in a row. The Clutter Keeper products are designed to store your items in an organized way. Here are the two current products and how to use them in your KonMari organizing. 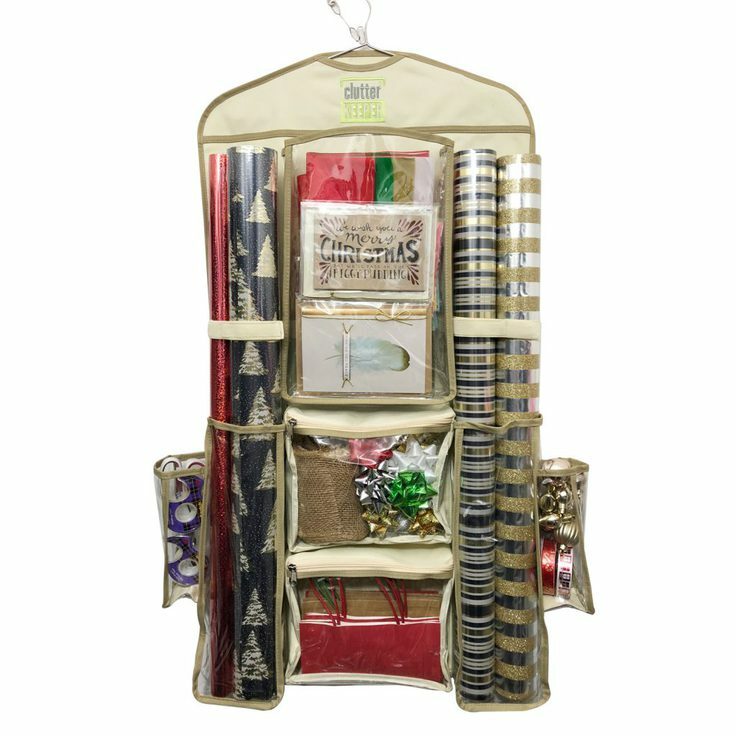 The Clutter Keeper Deluxe Hanging Gift Wrap Storage Organizer has expertly designed spots for every single gift wrap item you use. Plus it hangs up, so you can have all your gift wrap essentials within hands reach, but also put it all away when you don’t need it. 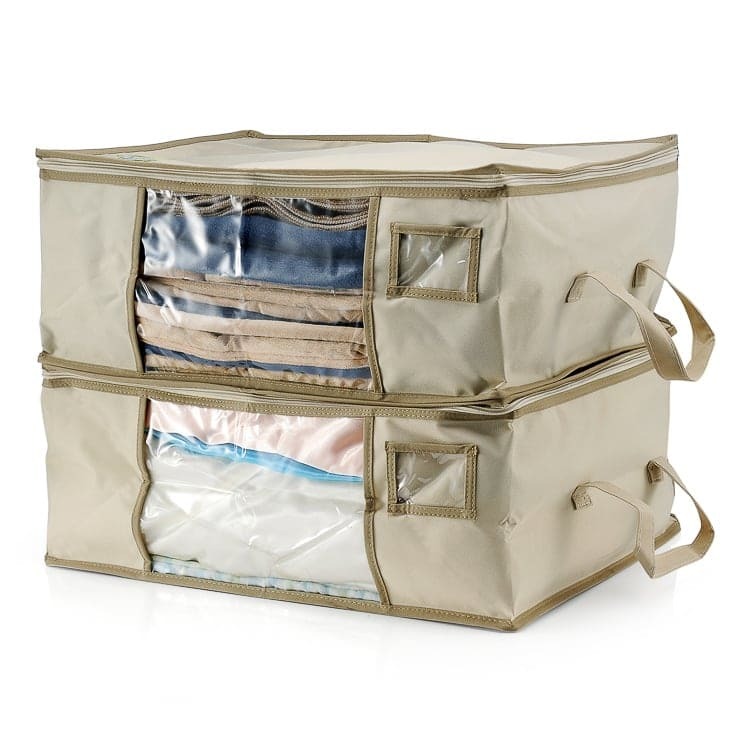 The Clutter Keeper Deluxe Storage Bag Organizer comes as a set of two high quality fabric bags. Each of the bags is 20 x 15 x 8 inches and designed with a clear window panel and label pocket so you can view what’s inside them to stay organized. If you want to use the storage bags KonMari style, just fold the items standing up and use foam boards or small boxes for extra organization inside the bags. You will be so much more successful at having a KonMari home if you do it with your family. You can’t do it alone. Marie Kondo has said on her show that she folds clothes with her children. They fold their own clothes with her (asking for help when they need it). She also frequently asks her children if certain toys bring them joy. If not, they donate them. Teaching children how to keep their area tidy and how to let go of things is a valuable life skill. Plus, with you all doing it together, the home will stay tidy longer. KonMari – Is It Right for You? Now that you know almost everything there is to know about KonMari, is it right for you? It is definitely a trend that is sweeping the nation. People are cleaning out closets and donating items in droves. Should you try it too? If you are more in touch with your feelings and an organized space makes you feel at peace and happy, you should give this a try. Set up a schedule and get your family involved. You can find inspiration and support online with the #KonMari hashtag. It’s amazing what a difference minimalism and a fresh outlook can make. Here are some more home organization guides that will inspire you to organize and sort through various rooms in your home.